You have to admit, whoopie pies are a pretty awesome invention. Just think about it. 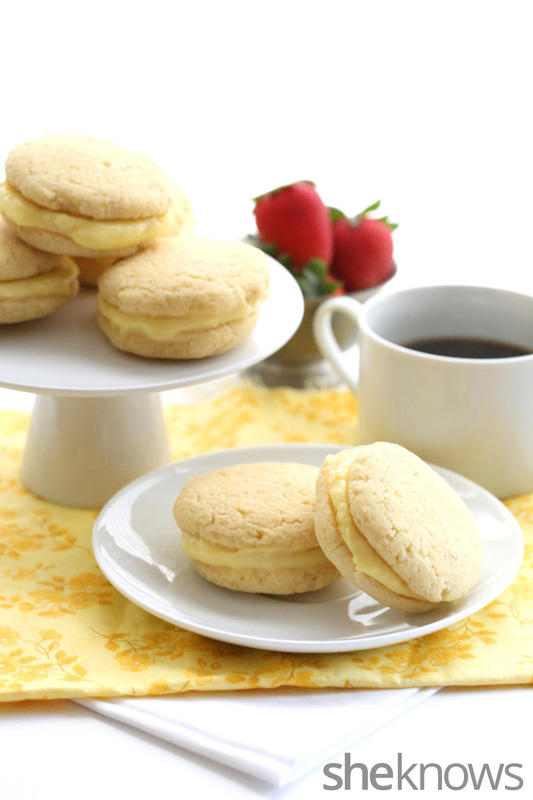 A delicious frosting or some other tasty filling sandwiched between tender cake-like cookies. It’s pretty much everything you could want from a dessert: cake, cookies and frosting, all rolled into one. And it comes in a portable form! You don’t have to stick to the traditional chocolate and vanilla variety, either. Creative bakers everywhere are adapting whoopie pies to all sorts of delicious flavors. With Mother’s Day just around the corner, lemon curd sandwiched between lemon-scented cakes makes an elegant treat for mom. Better yet, whoopie pies lend themselves very well to a healthy makeover. You can swap out the refined flours and sugars with healthier choices without sacrificing flavor and texture. 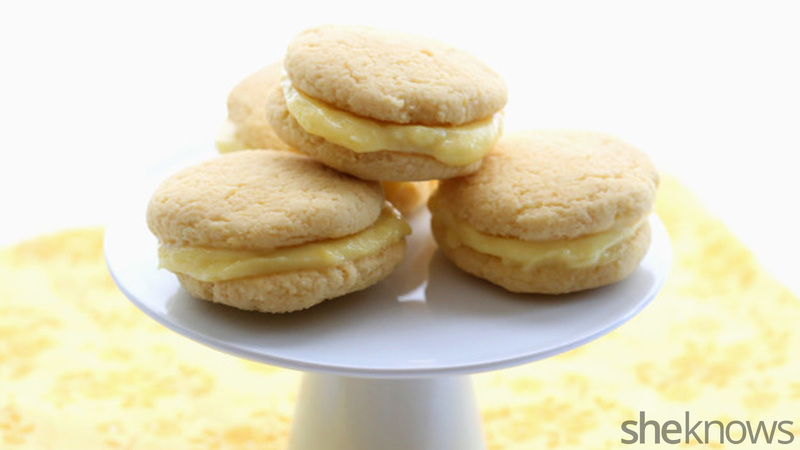 These lemony whoopie pies won’t derail anyone’s healthy diet. They are gluten free and low carb and they taste like the real thing. And each pie comes in at under 300 calories too. Treat mom right on her special day. Nutritional information: Food energy: 270kcal; Total fat: 22.74g; Calories from fat: 204; Cholesterol: 136mg; Carbohydrate: 24.93g (18 g carbs from erythritol); Total dietary fiber: 3.05g; Protein: 9.91g; Sodium: 228mg; Total NET CARBS = 3.88 g.
In a heat-proof bowl set over a pan of barely simmering water, whisk together eggs, egg yolks and sweetener. Stir in lemon juice and lemon zest and continue to cook, whisking continuously, until mixture thickens and reaches about 170 degrees F on an instant-read thermometer. This can happen very quickly, so watch carefully. Remove from heat immediately and add butter pieces. Let stand a few minutes and then whisk until blended and smooth. Press plastic wrap flush to the surface and chill at least 3 hours. Preheat oven to 325 degrees F and line a large baking sheet with parchment paper or a silicone liner. In a large bowl, whisk together the almond flour, sweetener, whey protein powder, coconut flour and baking powder. Stir in eggs, melted butter, almond milk, lemon zest and lemon extract until well combined. Using wet hands, form dough into 1-1/2-inch balls (you should get 20 or so), and place on prepared baking sheet. Press down into 1/2-inch thick disks with the palm of your hand. Bake 12 minutes, or until just lightly browned and set. Remove from oven and let cool on pan. 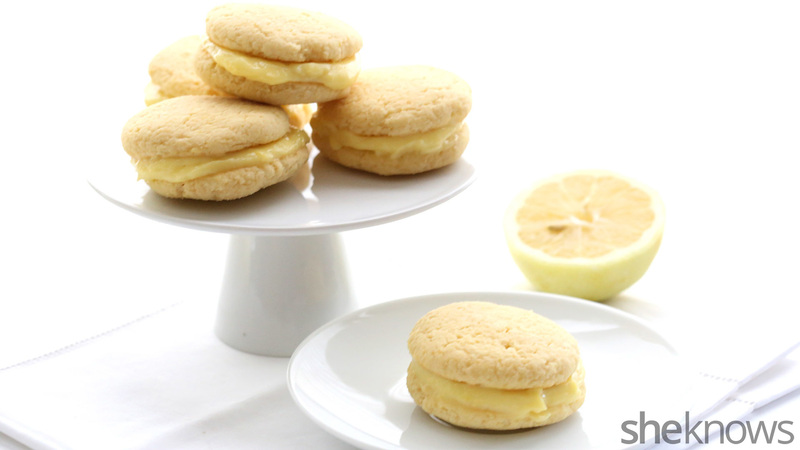 When cool, spread the bottom of one cookie with lemon curd and top with another cookie. Repeat with remaining cookies and lemon curd. For more great low-carb and gluten-free recipes, please follow me at All Day I Dream About Food.